I am really becoming depressed. I am totally out of control in the eating/losing weight department. I very much want to be in control of my eating habits and be thinner/healthier than I currently am. I went to a nutritionist a couple of months ago and I lost a little. But then I felt like it was expensive and I already knew everything that she was telling me, I just had to apply it. So I stopped going... but now throughout the winter I have been slowly been putting on weight. The logical part of my brain tells me that I have to just shut my mouth and restrain myself from eating everything that I want to, but then I just lose it and give in. I'm so upset at myself.... I know that with the spring/Pesach coming, I won't be able to hide under my coat anymore, and I want to look nice, but I am having such a hard time. Anybody have any tips? I dont want any crazy diets. My husband went to nutritionists on and off for years. When he goes regularly, he loses weight. When he doesn't go, and says he knows what to do on his own, he gains and loses the same 5 lbs for years. There's something powerful about being accountable on a weekly basis. Even though it's expensive, it's worthwhile for your health and confidence, IMHO. I really very much want to be able to do it without a nutritionist. How can I translate my wanting ---> actions. I feel like I have no willpower, and I just cant control myself. I feel like crying as I write this. Stop eating carbs. No sweeteners.no fruit. No processed foods. It won’t be hard after the First couple of days. Slso, it’s not crazy. It’s sane. And it’s a chemical reaction. You are not a glutton. You can’t help it. Except if you do what I’m saying. Then you’ll be able to stop. I am 5 ft 1 and weighed 315 pounds. 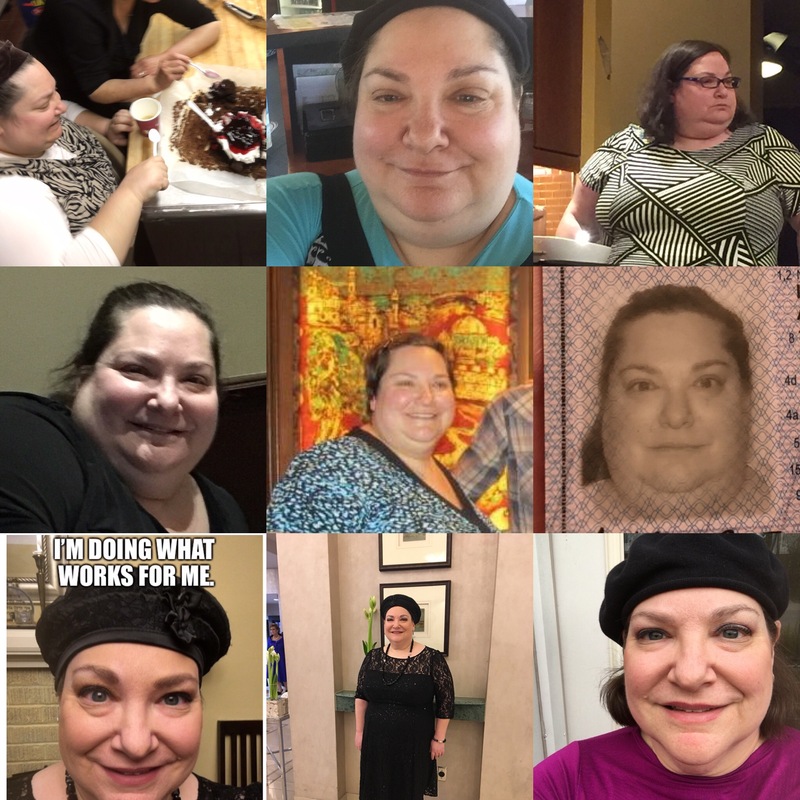 I’ve lost and maintained an 80 pound loss for a year. And it’s not hard. I’ve been doing this for almost two years. I do t suffer. I feel amazing. I never even want to cheat. Ya feel me? Get off the merry go round. It sounds like you need someone to weigh you weekly in order for you to stay accountable. Why don’t you join weight watchers. Please do not eliminate an entire nutrient group without medical supervision. What worked for Andrea may not be appropriate for you. To be honest, then you don't want to lose the weight. If you do what a nutritionist advises, it's possible that you'll only need to be on the program for a few months; it doesn't need to be forever. Also. The Chofetz Chaim says that there are two things that are easier to do, than to refrain from doing: talking and eating. You're in good company. Most people can't lose substantial amounts of weight and keep it off without support. Do your research. This may be the only thing that works for her. People this sensitive to insulin reactions don’t get peace until they do this. I agree that everyone should have medical supervision. For all their lives. To be able to check blood levels etc. I certainly do. But there are two ways for a body to run. In a nutshell,On glycogen( carbs) or ketones and fat. The ketone way takes care of cravings. Ends suffering. If you don’t want to measure or be supervised ( I mean specifically follow a plan with measurement etc. This is a good option.). My accountability is here, Facebook and insta where I know people are watching my progress and process. There is literally no reason to keep suffering. It’s not hard at all. Maybe the first few days until you get the hang of it... but it makes you accountable for what you eat. Obviously you will otherwise keep eating and not loosing weight. You count points and can have almost anything. For example, a slice of pizza is 9 points. You eat your slice and don’t take more. You need a system op, or you will just keep gaining and never loose. You can count calories, points, grams of fat... whatever it is but you have to count something! Look what’s happening... you are just eating whatever you want and gaining. How can you possibly think you will ever look good when you take your coat off if you keep this up? I did the nutritionist route & while I did loose weight I did not like feeling like a naughty child. Weight watchers is great & I learnt about which foods are good to eat on the free list . However counting points is a pain. So now I’m on 16/8 diet while incorporating much of what I learnt during weightwatchers. Basically you fast (water, unsweetened tea & coffee are allowed) for 16 hours. You eat freely for a 8 hour time slot. During the week I start eating 10:30am & end 6:30pm. Friday’s I start 12 or even 1pm due to Friday night seuda. It’s easy. No counting. No food enters my mouth for 16 hours. It’s not magic . The weight loss is slow but steady. I’m not feeling deprived. I’m not cooking special foods. Obviously I’m also not eating junk but an occasional chocolate is fine . I am not dreaming of stopping when I reach my goal weight either. I can adjust my 8 hour eating block to suit whatever I’m doing. You can get the app myfitnesspal. You can log what you eat,and see how many calories. It helped me control myself. I did nutritionist route for years. Up and down. Draining on my emotional and financial well being. I finally started focusing on what I CAN eat instead of what I can’t. I made sure to have protein and fat with whatever meal I was having. Especially with carbs. There is so much delicious filling good for you food around. If you focus on eating those foods- you will feel satisfied and won’t feel the need to over eat. I have been maintaining my weight for 3 yrs with this already. I don't want to count points either. I've seen so many people lose weight on plans and then put it all on again. What works for me, and what I suspect would work for many people, is to change my eating and try to do this for life. I do eat carbs. I'm doing it now. A measured half a cup of healthy, whole grain, no sweetener cereal, with lots of cinnamon. It's an antioxidant and adds a feeling of sweetness. Sometimes I'll put in fruit. But I stick with whole grains, including pasta. And I eat fruits and vegetables. And nuts. And protein but I avoid red meat and keep animal protein for later in the day. I've cut out sugar and white flour, though if I have a bite of something the world will not come to an end. But it's one bite. That I often spit out half of. Oh, and I allow myself chocolate. If I would tell myself, one square a day, I wouldn't be able to handle it. But now, instead of having a few squares at a time, more than once a day, I nibble. I break off a third or a quarter of a square at a time. And leave the room. And I might come back for more. I usually end up with no more than 1-1.5 squares a day. I'm sure nutritionists can do a lot. One very important thing might be identifying emotional triggers and giving alternatives. Like for me, I can't give up chocolate but b"H I've been able to limit it greatly. And I make honey whole grain mini muffins that yes, have chocolate chips in them. Or if I want to eat something, I'll eat seasoned (spray, sprinkle spices) air popped popcorn. If I was doing points, there would go a lot of calories and points. But I'm not counting, so if I need crunch and satisfaction, I can eat something that satisfies, and that I will not regret nutritionally. I'm not saying that everyone needs to do it my way. And I really don't want to sign my sn, for anyone who does know me, because even after all these months I'm nervous about being able to sustain it. But I think I can, and the thought doesn't fill me with dread. Have you looked into Noom? Ok so don't kill me for this. 95% of dieters who lose a real amount of weight will gain it back within 3 years. Hashem programmed our bodies to fight starvation. When you lose weight, your body thinks it's starving and sends powerful messages to the brain to get it to eat. The longer you've been dieting, the more your body will try and convince you to eat. In extreme cases, dieting can lead to binge eating disorder, slowed metabolism and many other negative consequences. If you're worried about your health, yo yo dieting is harder on the body than just staying fat. Chronic dieters have been found to be at a higher weight than non dieters with the same starting weight. Mortality rates across the weight spectrum even out when accounting for healthy behaviors such as eating fruits and vegetables and exercising. My advice is not diet advice but it's advice on how to get in control of your eating habits. Make sure you are fully satiated at every meal and you won't be as tempted to mindlessly munch. Accept the size body Hashem had put you in, the same way you accept your height, eye color, and other physical features. Look into Intuitive Eating and Health at every Size for guidance on how to be healthy and fit without obsessing over something you can't control. I was waiting for someone to mention Intuitive Eating. There are some interesting threads here.